Patch 5.2 is out and it offers a lot of fun new content for players. I think I speak for everyone awesome when I say that the most pertinent of these new things is: dinosaurs. We get a lot of them, which is good, because there is no such thing as too many dinosaurs. So this is my guide to acquiring new dinosaurs because if you are even remotely cool, this has now become the most urgent goal in your life. If you’re just looking to chill with some prehistoric badasses, but suspect you can’t handle the coolness of owning your own, Blizzard has given us an entire island full of nothing but dinosaurs of all sizes and varieties: The Isle of Giants. It is covered with elite adult and young triceratops direhorns, tyrannosaurus rexes devilsaurs, and pterodactyls skyscreamers in a rainbow of colours. Okay, but now on to the important question: how do you cash in on this stuff? So of course you want a dinosaur mount. Everyone wants a dinosaur mount. Lucky for you, there are a lot of new dinosaur mounts to choose from. The easiest direhorn mounts to acquire drop from the elite Zandalari Warbringers that spawn around Pandaria. At around a 5% drop rate, you will likely need to kill a bunch of these, but luckily they spawn pretty regularly (around every 30 to 60 minutes) and drop other awesome things to soothe your poor, dinosaurless soul. These Warbringers are trolls riding the dinosaurs you’re trying to steal, and come in a slate (pale blueish), amber (greyish yellow), and jade varieties (bright greenish). The mount on their loot tables matches the dinosaur they are currently riding; you won’t ever get a slate mount from a dude sitting atop a jade. Don’t be distracted by the Zandalari Scouts that patrol nearby; they don’t drop the mounts. Bring a friend or two to help you with these tough elites; the Warbringers can be duo’d if you know how to handle their abilities, but are very difficult to solo if you’re not a well-geared tank or a pro hunter. 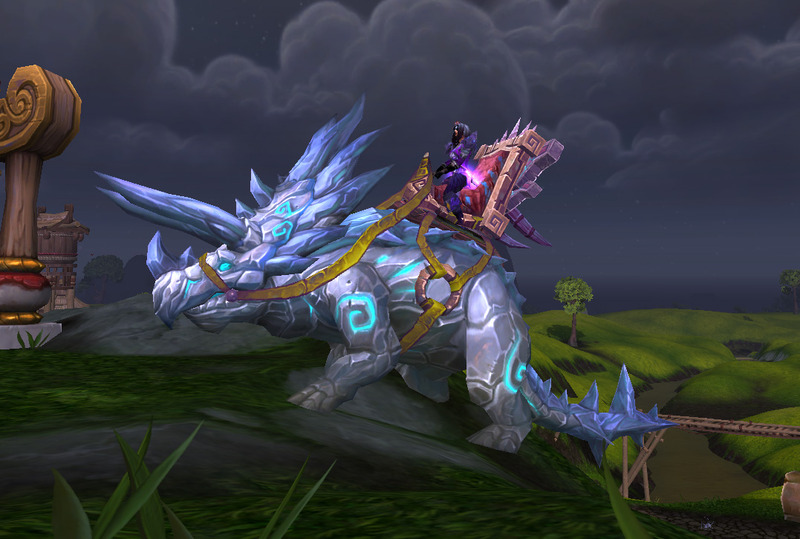 The other direhorn mount is a cobalt blue, and is a rare drop from the new world boss Oondasta. If your heart is set on this one, grab one hundred of your closest friends and cross your fingers. If you’re a raider, check out the second boss in Throne of Thunder named Horridon. Not only is he absolutely adorable to look at (little periwinkle feets! ), he has a rare chance to drop a blue & white direhorn mount. Finally, if you love dailies or at least are willing to slog through them for a triceratops, you can look forward to snagging your own crimson (if you’re Horde) or gold (as Alliance) direhorn for reaching exalted with your new faction on the Isle of Thunder. The new factions are the Kirin Tor Offensive for Alliance and Sunreaver Onslaught for Horde. The new raptors come in black, red, green and white. Most people will probably want to focus on the black, red, and green varieties, as these do not require insanity and huge amounts of time to acquire like the white one. Elites mobs on the The Isle of Giants (all of them except the Zandalari Dinomancers) have a small chance to drop the Primal Egg you are seeking. The smaller elite dinosaurs on the island can be solo’d by most classes, although the bigger devilsaurs and triceratops may require a couple people, so getting your egg should just be a matter of getting enough kills under your belt. Three days after getting your Primal Egg, it will hatch into a Cracked Primal Egg and inside will be a random raptor mount in one of these three colours. The mount is guaranteed from the egg, but it may take you awhile to get all three types since you can get duplicates. While you’re farming your Primal Egg, you will find that all these mobs also drop a few Giant Dinosaur Bones with each kill. Save these, because for the low, low cost of only ten thousand bones (okay, 9999 actually) you can purchase a bone white primal raptor mount from an NPC hiding in a cave on the island. As an added bonus, people will be able to more easily identify you as crazy when they see you rocking this painful-to-farm raptor. Right now, there is only one flying dinosaur mount in the game: the Armored Skyscreamer. This guy is the reward for completely the Throne of Thunder raid meta, so if you’re not a hardmode raider, you may need to wait a few tiers to pick up this sweet ride. Of course, simply riding a dinosaur is not enough. I mean, it is awesome, but not nearly as cool as riding a dinosaur, while your tamed dinosaur runs alongside you, keeping company with your battlepet dinosaurs, right? If you’re a hunter, The Isle of Giants is where the magic happens. Stable your active pets so you have lots of space for dinosaur shopping. To tame a direhorn you will need to acquire an Ancient Tome of Dinomancy from the many Zandalari Dinomancers wandering about the island. The mobs can be solo’d by the hunter, but you will probably want to pick up the Silencing Shot talent, as the heal they cast will put them back up to full health, making them a pain to kill without (they stop casting it once they reach 50%). Once you get your book, though, you’re set: you can now tame any of the triceratopsy young direhorns on the island, regardless of your spec. To tame a devilsaur, you just need to be Beast Mastery spec, no book required. There are quite a lot of different colours on the island, so just find a young one in whatever shade you desire, and tame away. Easy! To tame a skyscreamer, whine to Blizzard because right now you can’t. These are little armored baby raptors. 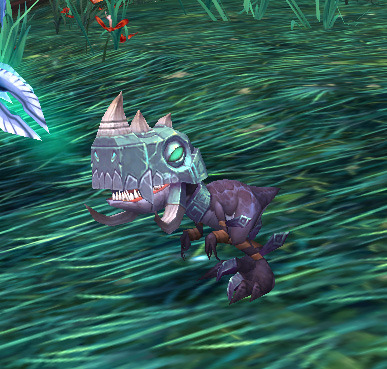 They are super cute and completely unique from the old raptor vanity pets. • Stunted Direhorn – Unfortunately, it looks like you’ll need to win 250 PvP pet battles to get this cutie. • Direhorn Runt – Is a rare drop from the Direhorn mobs found on The Isle of Giants. • Pygmy Direhorn – Is now a rare drop from Horridon!